Today the Museum dug out part of it’s collection on loan from Barnardo’s to go on display for the first time. Dr Barnardo’s very own desk will be on display t his weekend as the Ragged School Museum and Barnardo’s team up to celebrate the 150th Anniversary of Barnardo’s work since his arrival in London in 1866. 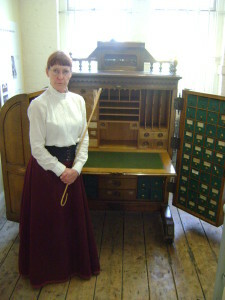 The beautiful writing desk, manufactured in the US from 1874 was the hub from which Dr Barnardo did much of his work that saw him raise over £3000,000 in his lifetime, “…it’s the Victorian equivilent to the ipad!”- Erica Davies, Director RSM. Complete with his own handwritten labels it really is something quite special and we have found ourselves gaping at it in wonder all afternoon. See it for yourselves this Saturday 7th May where it will be on display in our Mended Lives Gallery. The Museum will be open from 10am – 4pm and our Sunday Victorian Lessons will also be running for families. Comments Off on The Dr’s Desk! «Open House for Barnardo’s 150th Anniversary!